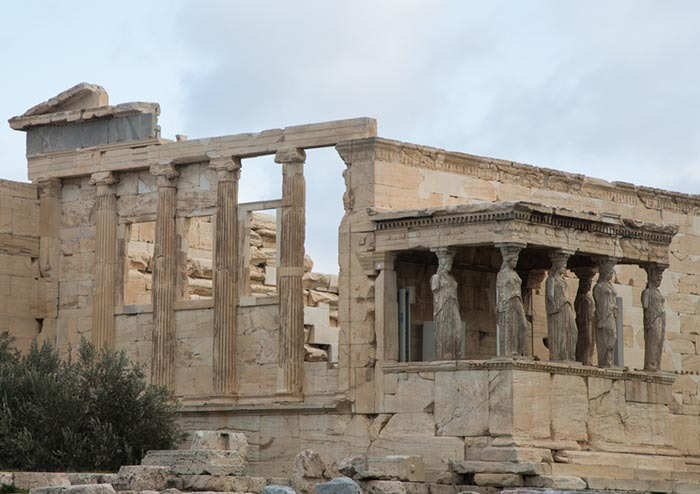 Its most famous ruins are from the Parthenon, which dates from about 447 B.C. Olive trees line the steps leading up to the ruins, which is only fitting since they provided the ancient Greeks with oil for heating, perfumes, and soaps, as well as food for their goats. Olives are still a major part of the Greek economy. We walked up and around an area with the ruins of buildings from 2500 years ago. Enough of the buildings remain to make their grace and beauty clear. 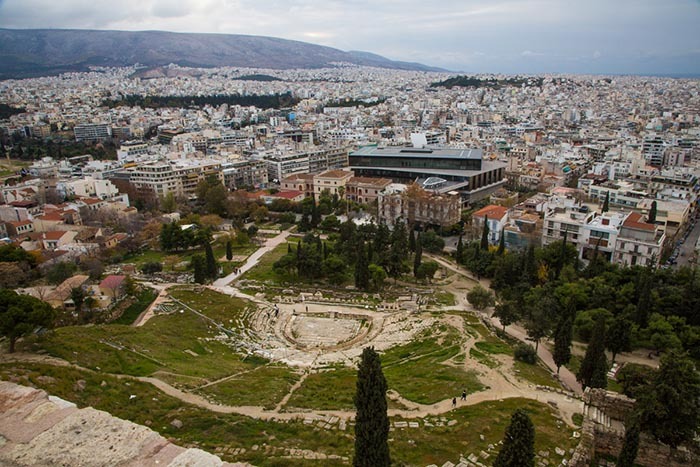 Many of the artifacts recovered from the site live in the Acropolis Museum; a visit is on the agenda for Saturday. 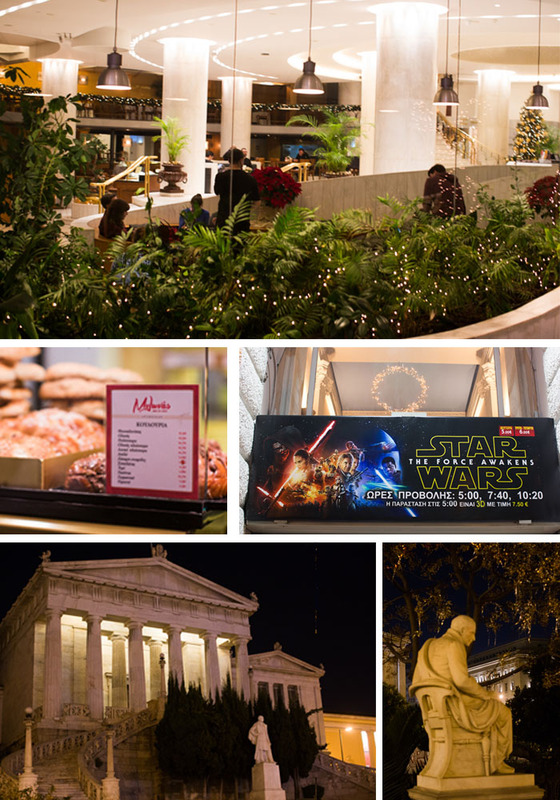 Next up was concert number two: an outdoor performance at Syntagma Square, a major public square in downtown Athens. 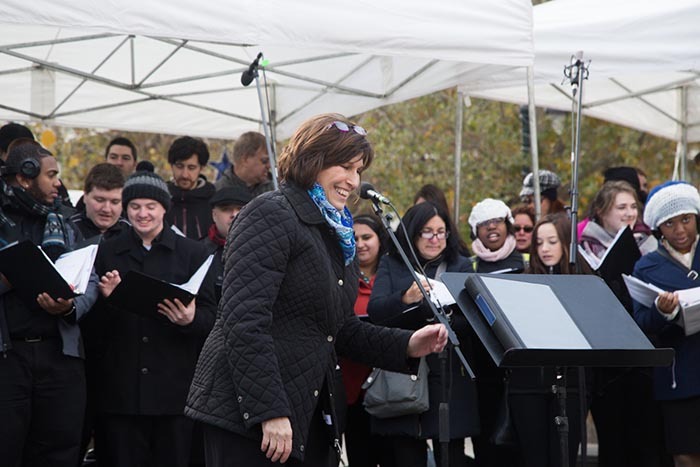 The sun provided a brief respite from the cold, and the choir was in high spirits. Selections included a number of familiar holiday songs, and audience participation was encouraged. Balloon vendors and dancers dressed as cartoon characters contributed to the festive atmosphere. 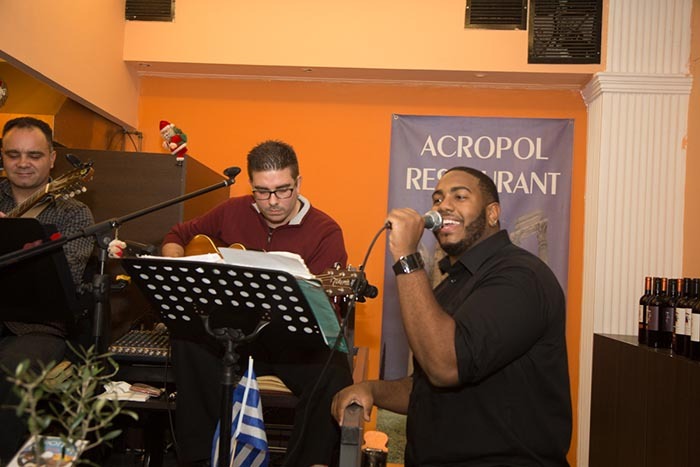 Then it was off to our New Year’s Eve celebration dinner; a lively affair at a restaurant in the Plaka shopping district where were serenaded by guitar and bouzouki (an eight-stringed instrument). There was dancing and renditions of “In the Still of the Night” by several choir members. 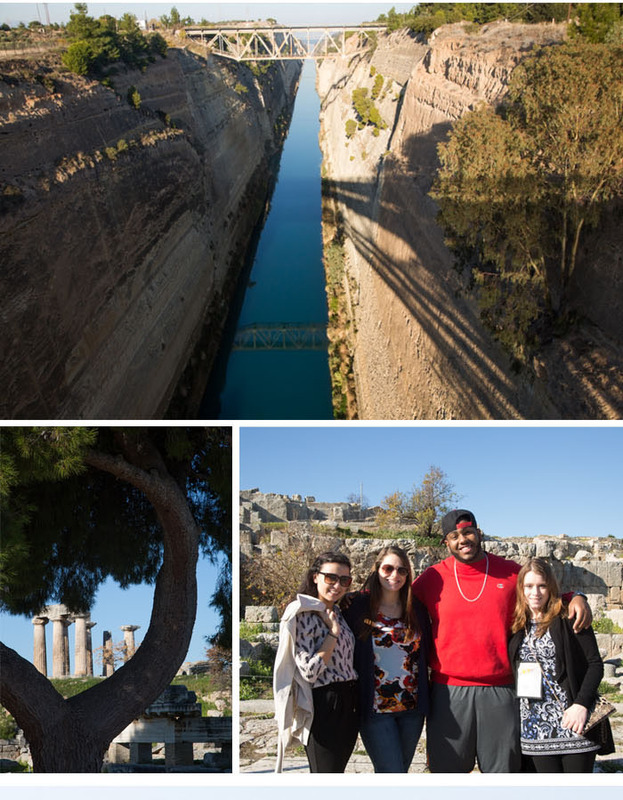 Photos from top: The Parthenon; A view from the Acropolis showing the Theatre of Dionysus, considered to be the oldest theatre in the world; choir members at the Acropolis; six figures of the Caryatid Porch of the Erechtheion; Venetian lions at the Beulé Gate; Honors College students with Terese Gemme at the Acropolis; Performing at Syntagma Square; Celebrating New Year’s Eve and Mary Rose’s birthday at the Acropol Restaurant. 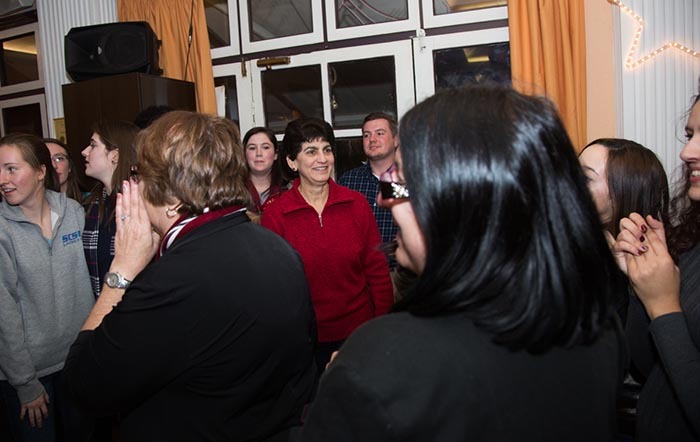 ; President Papazian (center) joins in the dancing. 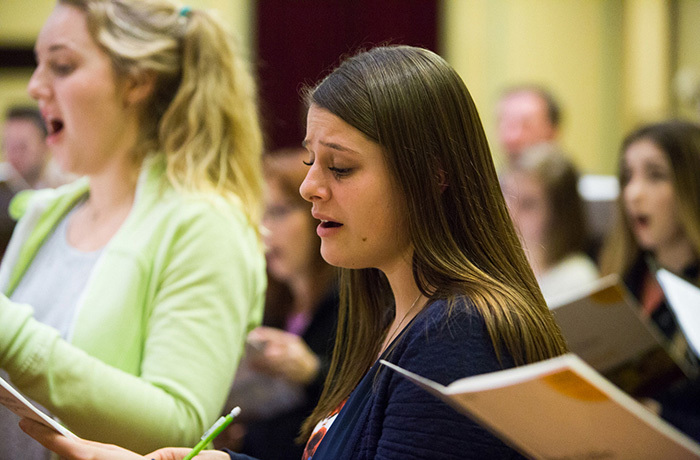 After hours of rehearsal over two days with guest conductor Simon Carrington and two other choirs, the Southern choir finally held its first performance Wednesday evening. 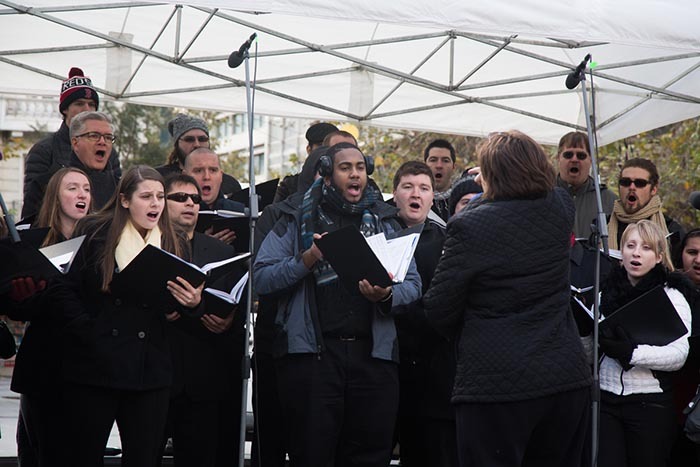 The 52-member Southern choir was joined by the University of Alberta (Canada) Madrigal Singers, and the East Lansing (Michigan) St. Thomas Aquinas Parish Choir. They sang three pieces: Missa Brevis, Moonlight Music, and Aesop’ s Fables. The Southern choir by itself also performed a traditional Greek folk song, The Kalanta of the New Year (St. Basil’s Day); “Lullaby” from Three Nocturnes; Go Tell it On the Mountain; and I Believe. The haunting lyrics from the last piece were found etched into a basement wall in Auschwitz after the holocaust. I believe in the sun even when it’s not shining. I believe in love even when I don’t feel it. I believe in God even when He is silent. Top: Southern choir director Terese Gemme addresses the audience. 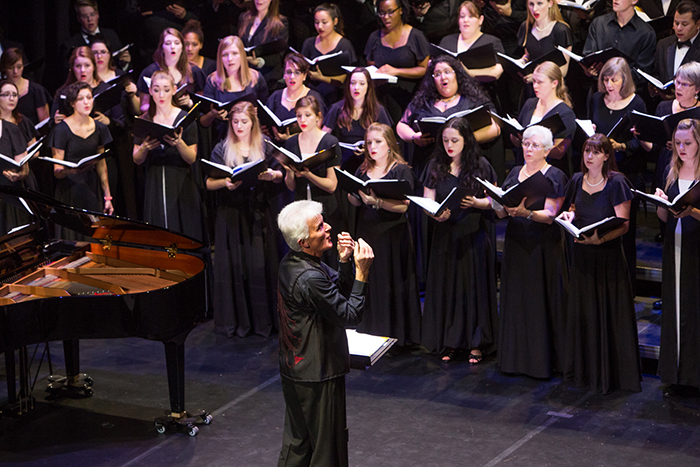 Above: Guest director Simon Carrington leads the Southern choir. 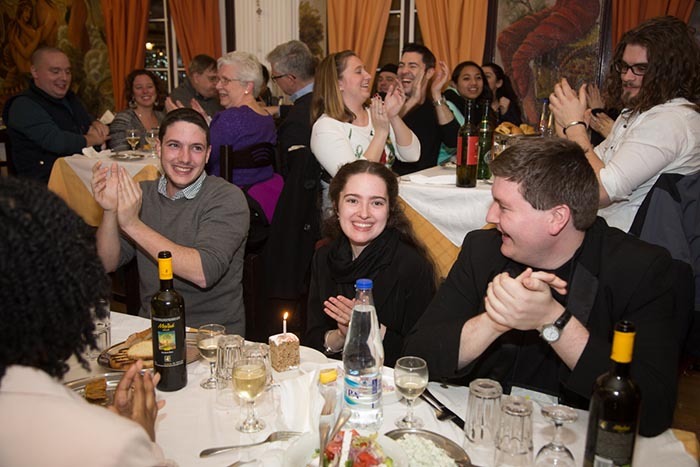 After a second rehearsal at the Literary Club Parnassos on Tuesday, we sat down to a festival welcome dinner at the hotel’s rooftop restaurant, The Olive Garden (not to be confused with the Italian restaurant chain of the same name). 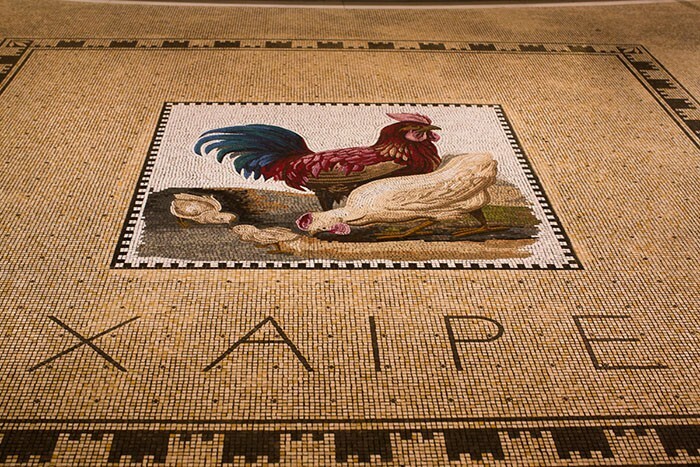 Fun fact: Greece is the third largest producer of olive oil, after Spain and Italy. While helping ourselves to the sumptuous buffet, we enjoyed a breathtaking view of the Acropolis glowing in the distance. All were in great spirits, anticipating their first performance Wednesday. The romantic atmosphere even inspired two couples to announce their engagements! 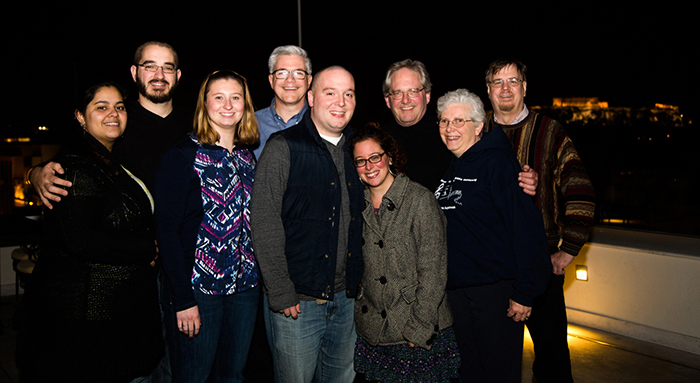 Geeta and Matt, left, and Nick and Ashley, center, pose with choir members after sharing the happy news. 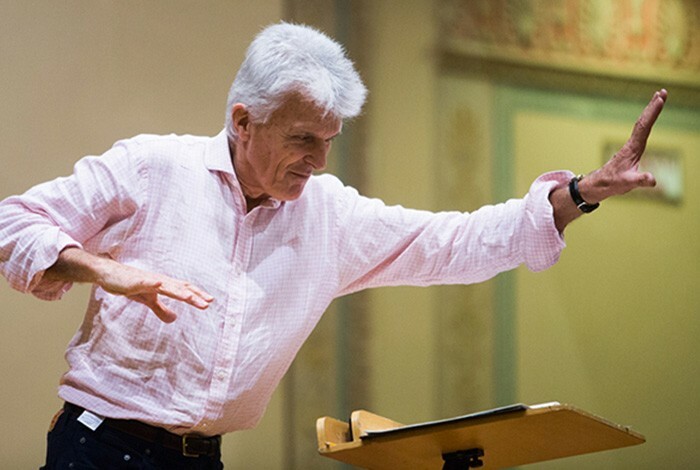 Top: Maestro Simon Carrington directs the choir during rehearsal. Above: Choir members atop the hotel at the festival welcome dinner. 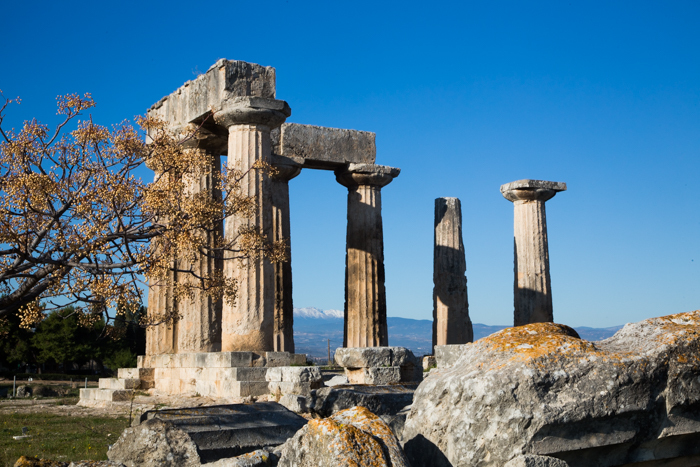 Tuesday dawned sunny and warm, perfect for a trip to the ancient city of Corinth. We boarded our motor coaches at the hotel entrance for the hour-long ride, guided by our Athens-based historian, Yannis, who provided colorful commentary on everything from the number of taxis in Athens (16,000) to the four pillars of the Greek economy (shipping, agriculture, industry, and tourism). On the way were groves of olive, cypress, and pine trees; mountains disappearing in the mist; car dealers and auto parts stores; oil refineries; and highway signs in a mix of English and Greek. We passed a number of small, ornate roadside shrines, marking the sites of car accidents. Friends and relatives construct these as a thank you to the saints for sparing the lives of those involved in the accidents. Located on the isthmus that connects mainland Greece with the Peloponnese, and surrounded by natural springs, Corinth was the biggest city in ancient Greece. Ancient Corinth became a center of early Christianity, following visits by Paul the Apostle, a Christian leader who is credited with several chapters in the new testament. 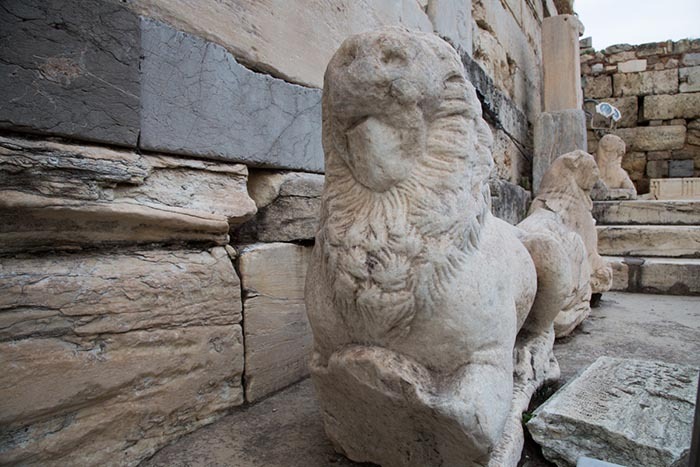 The ruins, a few miles from modern-day Corinth, were first excavated in 1892 by the Greek Archaeological Service, and are dominated by the remaining pillars of the Temple of Apollo. On the way back to Athens, we stopped for lunch and a visit to the Corinth Canal. Constructed in 1893, the canal shortened the trip between Greece and Italy. Now popular among “bungy” jumpers, the canal is four miles long by 70 feet wide, with a height of about 300 feet, and rock walls that are nearly vertical. Several bridges span the canal, offering a breathtaking view. the remaining pillars of the Temple of Apollo; the Corinth Canal; at the Corinth ruins. 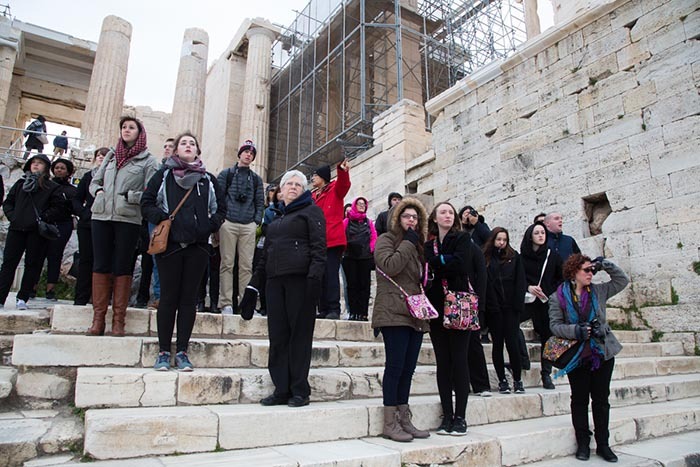 After two days of travel, the Southern choir still managed to muster enough steam to attend the first of three scheduled rehearsals upon arrival in Athens on Monday night. The trip began with a flight from New York to Zurich, Switzerland. Due to a heavy blanket of fog, we sat in the Zurich airport drinking $7.50 cups of coffee. Our arrival in Athens was a bit behind schedule. But the greeting from our tour guides, Alex and Tassos, and the transfer to the hotel, could not have been smoother. We arrived in two state-of-the-art motor coaches, where porters unloaded our luggage. On the way Alex gave us a brief descriptive tour of the area. Our hotel, the Titania, is in the heart of the city, among parliament buildings, museums, foreign embassies, and ministries. Even in the dark it was still easy to admire the neoclassical style of the buildings. 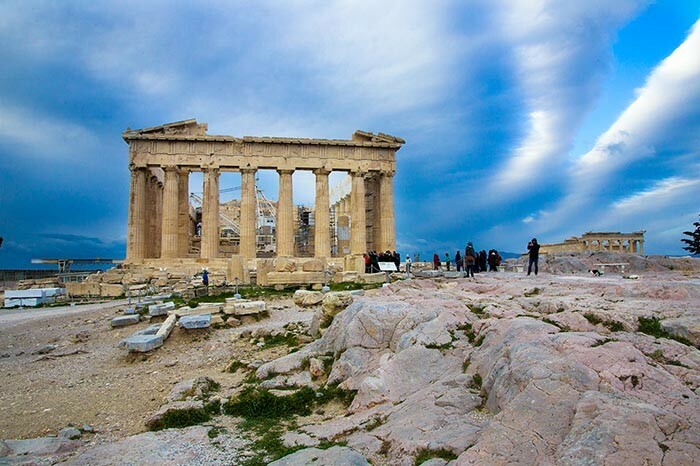 Although Athens is considered the cradle of western civilization, today it is a thoroughly modern city. In 2014, Athens had an estimated population of 3.75 million in the metropolitan area.. There is even an IKEA! Tuesday: a visit to the Corinth Canal, more rehearsal, and dinner at a rooftop restaurant with views of the Acropolis. Pictured above: The Titania hotel lobby and surrounding neighborhood. 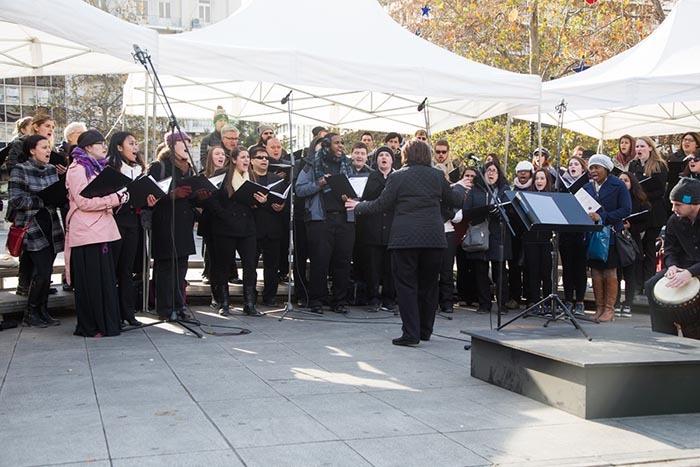 Southern’s globe-trotting University Choir, led by Director Terese Gemme, travels to Greece this Sunday, thanks to the vision and support of Walter Stutzman and the Stutzman Foundation. 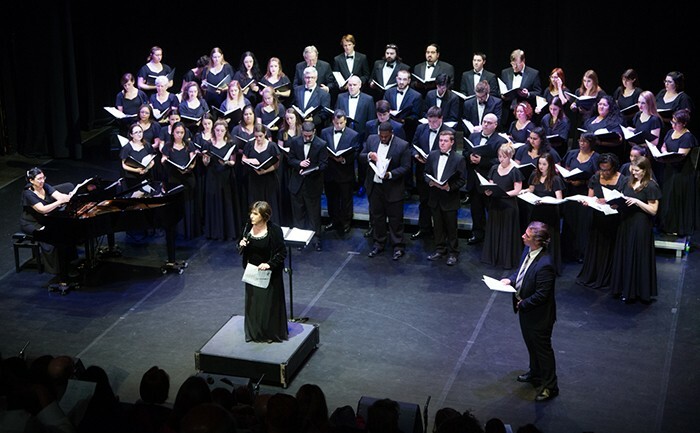 By arrangement with host company KIconcerts, our choir will be performing in several venues around Athens, including, by special invitation from the city, a Gala New Year’s concert at Syntagma Square. 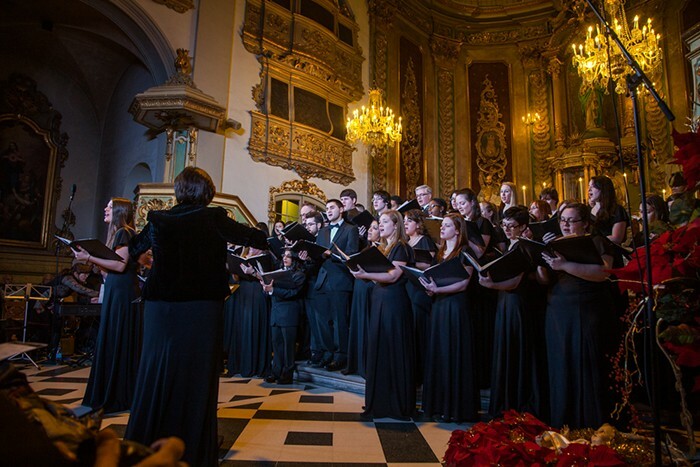 On Jan. 2, the choir will perform as part of a special holiday program at the Piraeus Municipal Hall, a classic architectural gem. In addition to a busy rehearsal and concert schedule in Athens, the choir will travel to the islands of Hydra and Aegina, Delphi, and Corinth. 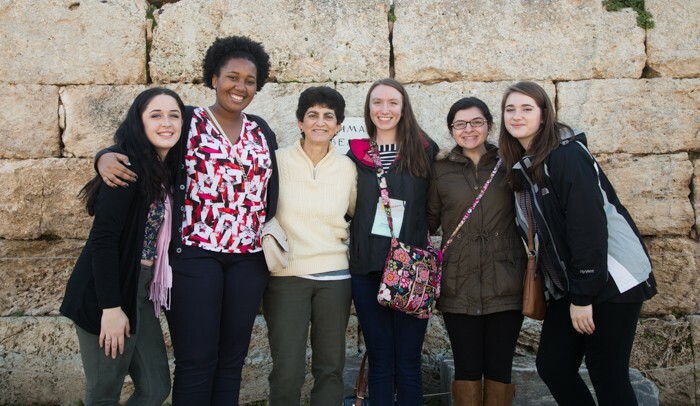 This exciting trip will once again enhance the students’ musical education and global awareness, while providing them with a life-changing experience. A half dozen Southern students have received their doctoral diplomas in nursing education – the first group of students to earn that designation from the university. The students participated in the winter graduate commencement exercises at the Lyman Center for the Performing Arts. The undergraduate commencement ceremony was held earlier in the day. The Ed.D. 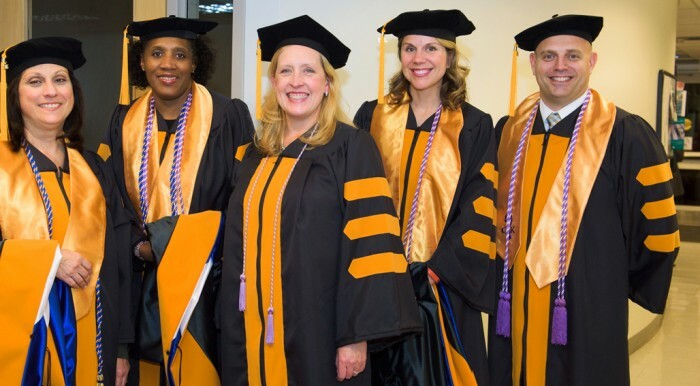 (Doctor of Education) in nursing education program was launched in 2012 as a collaborative effort with Western Connecticut State University in Danbury. The six SCSU contingent is among a group of 14 students who have completed their degree requirements at the two universities. “It is exciting to have our first graduates receive their degrees,” said Lisa Rebeschi, chairwoman of the Nursing Department. “Each has worked diligently in their pursuit of developing the science of nursing education. The students have completed dissertation studies that add to the body of knowledge with regard to teaching and learning in nursing education. The program is geared toward individuals with a master’s degree who would like to teach nursing. It typically takes students about three years to complete the 51 credits needed. The students take the classes part time so that they can continue working while they pursue their degree. Rebeschi said enrolled students come with varied professional backgrounds and have previously demonstrated clinical expertise in nursing practice. “The structure of the program allowed me to continue working as an advanced practice registered nurse while completing my degree, thus lowering the financial impact on my family,” said Philip Martinez, who works at Middlesex Hospital in the Department of Pulmonary and Critical Care Medicine. He also serves as a specialty coordinator for the Graduate Entry Prespecialty in Nursing (GEPN) program at the Yale School of Nursing. “I am quite proud of being in the first cohort of graduates and plan on using my degree to continue teaching in the university setting, while continuing my research on the academic needs of second degree nursing students in accelerated nursing programs,” he said. Rebeschi said Linda Roney, who became the first student to complete the degree program when she successfully defended her dissertation in August, is another example of someone with valuable clinical experience. Roney served as the pediatric trauma program coordinator at Yale-New Haven Children’s Hospital from 2009-2014. She currently serves as a full-time faculty member in the Fairfield University School of Nursing, while maintaining her practice as a clinical nurse at Yale-New Haven Children’s Hospital Bridgeport campus. Most nursing doctoral programs in the country fall under the Ph.D. (Doctor of Philosophy) or D.N.P. (Doctor of Nursing Practice) designations. The former focuses on research, while the latter centers on clinical skills. But the Ed.D. program is geared toward developing nursing teachers and was one of only a handful in the country when launched. It is designed to address a state and national shortage of nursing faculty. With such a shortage, it is difficult for colleges and universities to maintain or expand their nursing programs, even though there is both a serious need for more nurses and increasing student interest. *Two photos from the Dec. 18 Undergraduate Commencement ceremony appeared on the front page of the New Haven Register on Dec. 19. In addition, the Register posted a photo album online from the ceremony. *On Dec. 17, the New Haven Register ran a story on the recently approved public utility management program – a collaborative effort between SCSU and Gateway Community College, along with the cooperation of the Regional Water Authority and other area utility companies. Southern will develop a specialization within the B.S. degree in business administration as part of an effort to meet the workforce needs of Connecticut public utilities. The public utility industry in the region projects that 1/3 of its existing workforce – mostly managerial and technical jobs – will be eligible to retire within the next five years. Therefore, the utilities are seeking to educate existing employees, as well as future hires, for those positions. The aging of the workforce is part of a state and national trend, and Southern may be the first university to offer a specialization to address this workforce need. The article quotes Ellen Durnin, dean of the SCSU School of Business, extensively in the article. The Harford Business Journal posted a short article on the program on Dec. 22. *Kelly Mabry, associate professor of communication disorders, was interviewed on Dec. 9 during the “Better People” segment of Channel 3’s “Better Connecticut” program. Theinterview – lasting nearly 6 minutes – pertained to her recent trip to Bolivia, where she participated in Operation Smile’s effort to help poor children with cleft palates and cleft lips. With her background as a craniofacial expert, she screened more than 300 children. Many of the kids had successful surgeries during the effort. *The recent partnership between Southern and Liverpool John Moores University (England) garnered media attention with a Dec. 1 story in the New Haven Register. The partnership is designed to offer students the chance to study on both sides of the Atlantic Ocean, and enable them to benefit from dual-taught undergraduate and graduate programs delivered by faculty from both institutions through video link and guest lectures. President Mary Papazian, as well as Jim Tait (professor of the environment, geography and marine sciences); Edward Harcourt, pro-vice chancellor of Liverpool John Moores; and SCSU student Shayne O’Brien were quoted in the article. *An opinion piece written by SCSU studentJustin Hitchcock was published Dec. 1 in CT Viewpoints, a sister publication to CT Mirror. Justin, who wrote the piece on why Connecticut should value its teachers more, is a student of Will Hochman, a professor of English who specializes in writing. 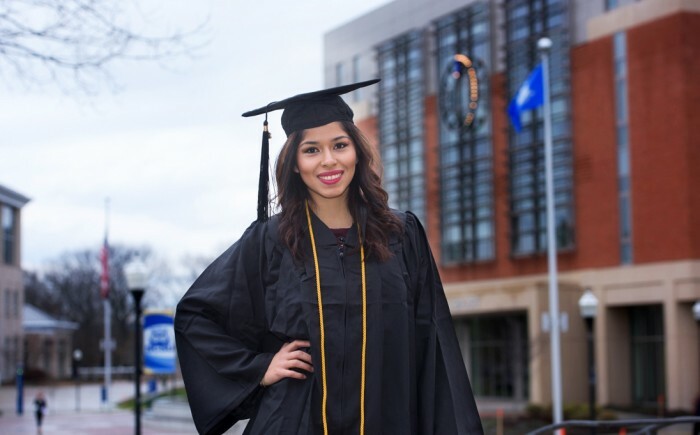 Karim Calle received her undergraduate degree in social work at Southern’s winter commencement exercises on December 18 — but she has spent years working for social change. “I am very active with my community, especially the immigrant community and my Hispanic community,” says Calle, who immigrated to the United States from Peru with her family when she was six years old. Calle recalls that her mother — then a widow with young children — often faced discrimination, which was intensified by language barriers. “I was her translator for everything, so I felt her pain, too,” Calle says. Her involvement with Unidad Latina en Accion (ULA) — a grassroots social justice organization made up of immigrants in the Greater New Haven area — came naturally. ULA is dedicated to furthering workers’ rights, and immigrant and civil rights, while promoting culture and the community. While Calle had already been active with the organization, her commitment was heightened by a requirement to complete community work as part of her social work major. “I did so much work for ULA that semester . . . so much more than was required,” says Calle, with a smile. A social policy class taught by Yan Searcy, associate dean of Southern’s School of Health and Human Services, gave her the opportunity to take her commitment to the next level. “With Dr. Searcy, I became much more involved in terms of lobbying . . . and learning how legislative sessions run. I didn’t know any of that until I attended his class,” says Calle. Calle wrote a testimony to members of the Labor Committee on behalf of some of these workers, after asking Dr. Searcy for advice. “The first thing he said, was just speak from your heart,” she says, noting she was present from 11 a.m. in the morning to 11 p.m. at night on the day she gave her testimony. Her commitment to following the bill didn’t end with the class. “I didn’t give up — not for one second,” says Calle, who hopes to attend a graduate program that combines community involvement and policy, and sees a future in politics. She recalls emailing senators and representatives, and asking others to do the same . . . visiting the Connecticut legislative office building up to three times a week. She dropped off literature compiled by ULA. Made phone calls and sent texts. Networked and brainstormed. Calle also kept in contact with her professor. Prior to the start of her last semester at Southern, she emailed Dr. Searcy a photograph. 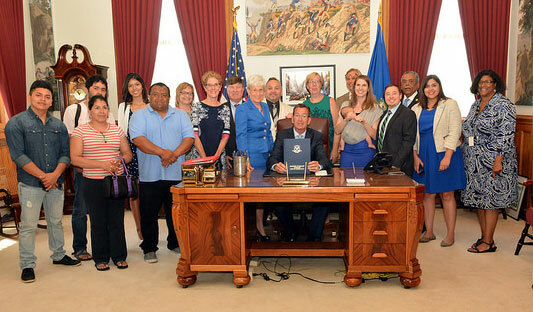 She is one of 17 people standing around Connecticut Governor Dannel P. Malloy at a bill signing ceremony for Public Act 15-86, An Act Concerning an Employer’s Failure to Pay Wages. Like the others pictured, Karim Calle is smiling. 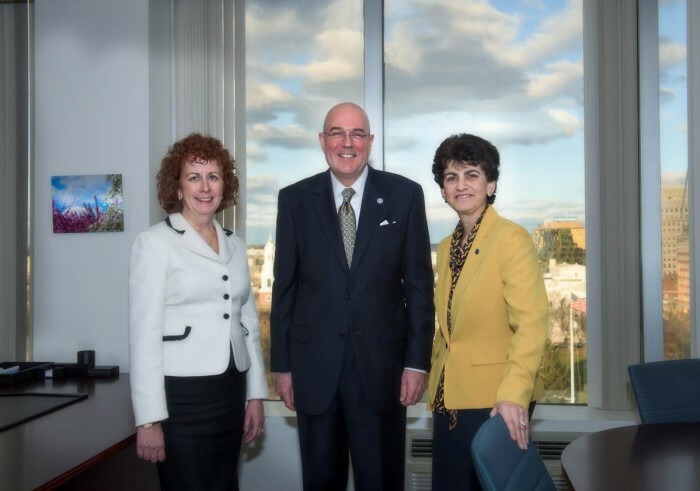 Pictured (left to right) are: Ellen Durnin, dean of the SCSU School of Business; Larry Bingaman, president and CEO of the Regional Water Authority; and SCSU President Mary A. Papazian. With nearly one-third of the workforce at the region’s utility companies eligible to retire within five years, Southern and Gateway Community College are developing a pipeline to provide highly qualified individuals to fill those anticipated openings. In collaboration with the Regional Water Authority, the two schools have created a pathway for students to receive the education necessary to fill those projected managerial and technological job openings. Gateway is developing a certificate and an associate degree in public utility management. SCSU is creating a specialization in public utility management within the Bachelor of Science degree program in business administration – a program that may be the first of its kind in the country. The specialization, offered by SCSU, will include 30 credits that focus on management of public utilities, such as water, gas, electric and wastewater. New courses in crisis/risk management, green energy and environmental sustainability, and workforce safety and industry regulatory codes will be part of the program. It also will include existing courses – such as in business communications, business law, public utility/governmental accounting, and business continuity planning – which will have sections tailored to focus on elements of utility management. Many students are likely to begin at Gateway, attain an associate degree, and transfer to SCSU in their third year to complete their B.S. degree program with the specialization. But existing and incoming students at SCSU may opt to start their program at SCSU. The pathway was approved Dec. 3 by the state Board of Regents for Higher Education. Durnin said internships at various utility companies in Connecticut will be offered to SCSU students, as part of the new collaboration. Bingaman said that in the case of the RWA, half of its employees will be eligible to retire in the next five years. And more than a third are eligible to retire now. But this “graying of the workforce” trend is not unique to the RWA or public utilities in the region. Officials point to similar concerns throughout New England and in other parts of the nation. An aging workforce — combined with changes in regulations, technology and the push toward “greener energy” sources — pose new challenges for the utility industry. In addition, existing and traditional-age SCSU students may wish to pursue public utility management as a career. The departments facing the most pressing hiring needs in the public utility field include customer service, field operations, employee relations, information technology, purchasing, and finance and quality assurance, according to an industry study conducted by SCSU and Gateway. The average salaries range between $55,600 and $75,833, depending upon an applicant’s level of experience and educational background. For further information, contact Richard Bassett, chairman of the SCSU Management and Management Information Systems Department, at bassettr3@southernct.edu.